More than 30,000 teachers and educators from the Los Angeles Unified School District (LAUSD) are on strike for the first time in thirty years after weeks of failed negotiations. According to the Los Angeles Daily News, teachers, through their union, the United Teachers Los Angeles (UTLA), are demanding a 6.5 percent pay raise, more support staff such as nurses, librarians and counselors at local campuses, smaller class sizes, and better regulation of charter schools. The last teachers’ strike in Los Angeles was in 1989. The teachers’ strike began on Jan. 14 and continued throughout the week despite heavy rain and poor weather. Parents and children have joined the protest, picketing and rallying outside City Hall in Los Angeles. The Los Angeles Unified School District reported a loss of $125.1 million in gross revenue through day five of the strike. 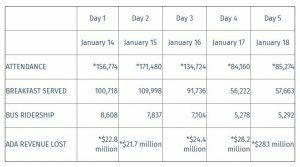 California funds its public schools based on attendance, and LAUSD has observed a 71,500 drop in attendance since the strike began, with only 85,274 of the district’s 600,000 students showing up to school on Jan. 18. All 1,240 K-12 schools in the district have remained open throughout the strike. LAUSD is the second largest school district in the nation, serving over 600,000 students from kindergarten through twelfth grade. LAUSD attendance and lost revenue over the first five days of the strike. Attendance numbers are subject to change as 18 schools have yet to submit reports. Contract negotiations arranged by Los Angeles Mayor Eric Garcetti resumed on Jan. 17 as LAUSD and UTLA met for the first time since the strike began. As both parties returned to the bargaining table, District Superintendent Austin Beutner expressed hope for concessions to come to an end. United Teachers Los Angeles President Alex Caputo-Pearl remains skeptical of finding a breakthrough. “After 21 months of negotiations, I think it’s an unrealistic expectation to say that this is going to be over after today,” he said. LAUSD and UTLA met for contract negotiations several times from Jan. 17 to Jan. 20 with no signs of settling. Teams from both sides met for nearly twelve hours at the City Hall on Jan. 19, and discussions recommenced at 11 a.m. on Jan. 20. Talks of settlement continued throughout Martin Luther King Jr. weekend. UTLA announced that the strike would resume on Jan. 22 despite negotiation outcomes, but ultimately cancelled their march as a tentative deal was struck between the two parties. 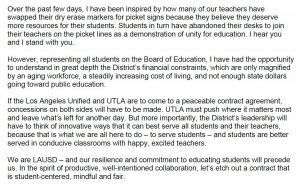 Student Board Member Tyler Okeke released a statement regarding concessions between Los Angeles Unified and UTLA.